There's a new hip hop supergroup in town, are you ready to get rowdy…?! 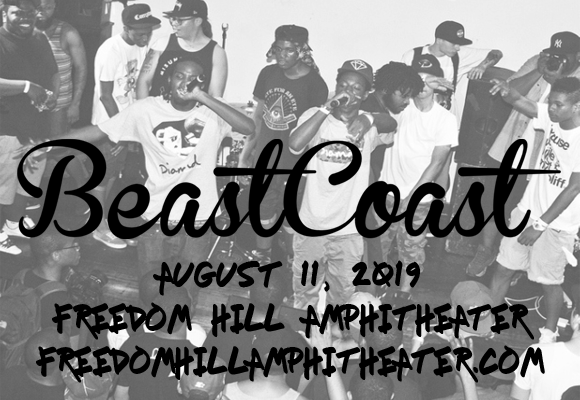 Beast Coast (ft Joey Bada$$, Flatbush Zombies, The Underachievers, Kirk Knight & Nyck Caution) are bringing their Escape From New York Tour to Freedom Hill Amphitheatre on Sunday 11th August 2019, and it's gonna be all kinds of dope! The collective will be going hard, busting out bangers like their red hot debut single “Left Hand,” and with their serious cuts, slick beats and high energy, this is bound to be the posse performance of the summer! Featuring members of Pro Era (Joey Bada$$, Nyck Caution, Kirk Knight and CJ Fly), Flatbush Zombies (Meechy Darko, Zombie Juice and Erick Arc Elliott) and the Underachievers (Issa Gold and AK The Savior), Beast Coast is a hiphop supergroup, formed in 2013. The group came together for a variety of festival appearances throughout the year, and have been recording and performing together sporadically in subsequent years. 2019 marks the release of the collective's debut studio single “Left Hand”. The name Beast Coast relates to its members being from the East Coast (mainly New York), and is a reply to West Coast rappers' assertion that "the West Coast is the best coast".